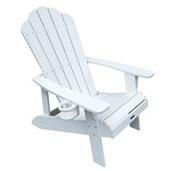 The attractive Island Retreat Adirondack Chair features traditional styling and built-in comfort. ELEMENT-PROOF - This solid chair features a fade-resistant teak color and is made out of waterproof materials. 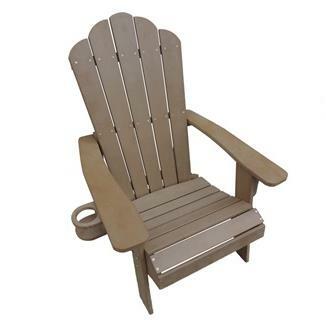 Leave these chairs outside year-round, and you'll never worry about weather wear. NO MAINTENANCE - Island Retreat's polyresin lumber requires no upkeep. It will not peel, rot, chip, crack or splinter. Painting, staining, and waterproofing are all a thing of the past. To clean this chair, simply wash with soap and water. COMFORT - Designed with a curved seat and ergonomic, contoured back, this Adirondack chair provides unparalleled comfort. LIFETIME LOOKS - The polyresin lumber gives the look of painted wood without the risk of splinters. Its rustic, teak color is fade-resistant, providing long-lasting elegance.